Several decades of research in economics and psychology show that childcare boasts substantial positive effects on human capital development and labor market outcomes—for both parents and kids. A critical question for policymakers, then, is how these benefits affect the net fiscal impact of a publicly financed, comprehensive childcare system that ensures access for all families in the United States. A new study on Norway’s universal childcare program sheds light on at least one way in which such a program’s benefits might cover part of its costs. 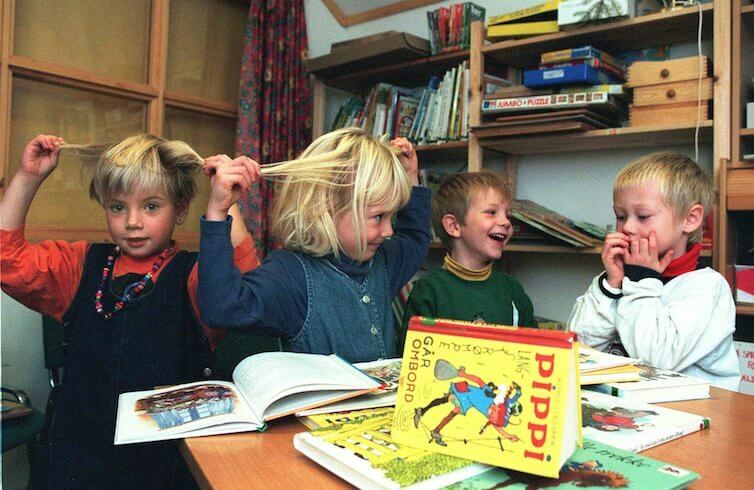 With the goal of making quality, affordable childcare available to all children, a bipartisan reform enacted by the Norwegian Parliament in 2002 dramatically increased state subsidies for childcare enrollment, lowered parental fees, and upped public investment in the construction of new childcare facilities. Exploiting differences between municipalities in the rate of childcare expansion in the aftermath of this reform, authors Martin Eckhoff Andresen, research economist at Statistics Norway, and Tarjei Havnes, associate professor of economics at the University of Oslo, estimate the effects of childcare use on labor supply, earnings, and tax payments for parents of 2-year-old children. Disaggregating the effects of the expansion in childcare availability on mothers by relationship status, Andresen and Havnes find large and statistically significant labor-supply responses for all mothers. Specifically, three co-habiting or married mothers entered the labor force—largely into full-time employment—for every 10 2-year-old kids enrolled in childcare. The results for single mothers were somewhat weaker: One single mother entered part-time employment for every five toddlers enrolled in childcare. These effects translated into higher annual earnings for mothers. On average, co-habiting and married mothers saw their wages increase by $6,000, and single mothers saw their wages increase by $2,400. In contrast to the strong impact on maternal labor supply and earnings, the expansion of childcare had little empirical effect on fathers. This nonresult probably reflects persistent social norms that assign mothers a disproportionate responsibility for child rearing, particularly when children are toddlers. Andresen and Havnes use their labor supply and earnings estimates to calculate the fiscal impact of Norway’s universal childcare program. Specifically, the authors find that at least 13 percent of the cost of expanding childcare for co-habiting mothers is offset by increased tax revenue generated through the additional employment of mothers in the 2 years following the program’s expansion. Additionally, the authors argue that the actual responses and budgetary savings may in fact be larger than their estimates, as initial take-up of public formal childcare may be incomplete. In conjunction with other recent empirical studies, Andresen and Havnes’s findings provide suggestive evidence that the fiscal impact of universal childcare may grow stronger over time. Their data show that the increase in mothers’ attachment to the labor market persists and remains significant for at least 4 years following the parliamentary expansion. According to contemporary research into the gender wage gap, this increase in long-run labor force participation should allow mothers’ wages to avoid the wage penalties associated with prolonged absences from the labor force and instead increase gradually over time. The authors argue that as a result of these labor market changes, expanding access to childcare in Norway produced an enduring increase in the nation’s tax base. While the social welfare system, childcare infrastructure, and tax system in Norway are different than those in the United States, there is nevertheless strong reason to believe that childcare expansion might have similar (if not larger) impacts in the U.S. context. First, the results of this study are consistent with others conducted in Quebec, Spain, Belgium, and elsewhere, which also found boosts in mother’s labor supply and government tax revenue from universal childcare. Additionally, Andresen and Havnes’s findings are similar to those in several other studies conducted in the United States, which verify positive effects on mothers’ employment from public childcare subsidies. Finally, in the context of the United States, where both childcare access and women’s labor force participation levels are significantly lower than those in Norway, there may even be more room to increase women’s labor force participation and wages, thereby driving up tax revenues over the long-term despite potentially larger short-term costs due to more robust uptake. In the United States today, the underprovision of childcare services has substantial negative effects, depressing earnings and labor force participation for parents and driving suboptimal social and economic outcomes for children. Andresen and Havnes’s new paper illustrates that expanded childcare may come with substantial positive effects both for parents’ employment and aggregate tax revenues. Beyond these effects on parents, research documents that childcare expansion can also produce dramatic improvements in children’s health, cognitive and social skills, educational outcomes, and labor market opportunities. In light of Andresen and Havnes’s findings, the implications of these improved outcomes for aggregate economic growth and additional tax revenues in the United States could be an exciting topic for future empirical research.